I’ve been driving past this place for seven years, and never once desired to try it. Tuesday night parma and pot for $10, Candy the Clown on Sundays. No thanks. Then about a year ago the place shut down with a promise on the takeaway blackboard that they would reopen “soon”. Finally a couple of months ago there were signs of life, a new coat of paint outside, hints of cool new lighting inside. The Plough was back. One rainy Thursday night about month after their grand opening, we wrapped up warm and ventured out. The parking is limited around this part of Footscray but we found a spot beside Mitre 10 on the Prince’s Highway (their car park takes about a dozen cars). Inside, the bistro area was busy enough, with people perched on bar stools drinking and eating at high tables. The pale wooden floors and modern bistro lighting invited us further in, to the restaurant where we were shown to a window table and offered a drink. The menu was relatively short but there was plenty to choose from: I’d call it posh pub grub mostly, with a decent list of pizzas too. The drinks list has a respectable choice of beers, but as non-beer-drinkers we satisfied ourselves with a couple of glasses of red from the short but well-chosen wine list, and some Mount Gay rum for my dining companion, served straight up with no mistakes (unusual in this town). For starters we chose a plate of “sticky buffalo wings” to share. These were a little disappointing: well cooked for sure, but a little lacking in the crispy-roasted-skin department. Too pale and slippery for our liking. For main course I was tempted by the fancy chicken parma (gypsy ham, mozzarella, beer batter chips) but we both opted for the burger: made from veal and heaped with caramelised onion, fresh tomato, a slice of good cheddar and a garlic aioli. The Plough is not too posh to offer tomato ketchup either. What a plateful of food. You need more than two hands to tackle the burger (I gave up, took the lid off and carved it up in the end) and the chips were plentiful and nicely cooked. We certainly enjoyed our first experience at the Plough, and ventured back a few weeks later on a Friday night. We were recognised and greeted by our original waiter like old friends which was a nice touch. It was much busier that evening and they were doing a blistering trade. Our starter was a shared plate of calamari with lime and chilli, which was perfect and not too huge a portion. Sadly our friendly waiter got my main course wrong – I was served another burger instead of a steak sandwich – but I wasn’t that fussed and didn’t bother having it changed. A complimentary glass of wine appeared by way of apology. Orlando’s Gippsland T-bone steak was perfectly cooked and generously proportioned. Another enjoyable evening that didn’t break the bank, we agreed. By chance I noticed a couple of days later that we had actually been charged a little over $355 for our modest evening meal. We returned and a refund was arranged quickly and without fuss. All in all, there are still a few rough edges to the service but none of it has put us off our new local eatery. We are looking forward to spring and summer when we can stroll down there of an evening – and I am looking forward to our next visit when I shall try their pizza. Sweet Grass occupies a small patch of land that used to be an old-fashioned local garden centre. About a year ago, they sold up and slowly we saw something emerging from this unremarkable-looking site. A Japanese torii or gate; tall bamboo fencing; could that be Japanese panelling they were putting up around that sorry-looking verandah outside the office building? So this week, a quiet stroll to this new little place five minutes from our house uncovered a beautiful, unusual little cafe. Predominantly a bonsai nursery and showcase for the young owner’s landscape gardening business, Sweet Grass is an oasis of peacefulness hidden from the busy road. We sat in the late morning sunshine on the verandah, surrounded by cane furniture, painted panels of Japanese women in kimono, and the most beautiful bonsai lining the path alongside us. No food here, just a page-long list of coffees and teas including three types of green tea, plus a good choice in alcohol-free cocktails. We chose the Japanese green tea with roasted rice. Hau, the owner, served up a big pot with some chocolate snacks on the side to tempt us. 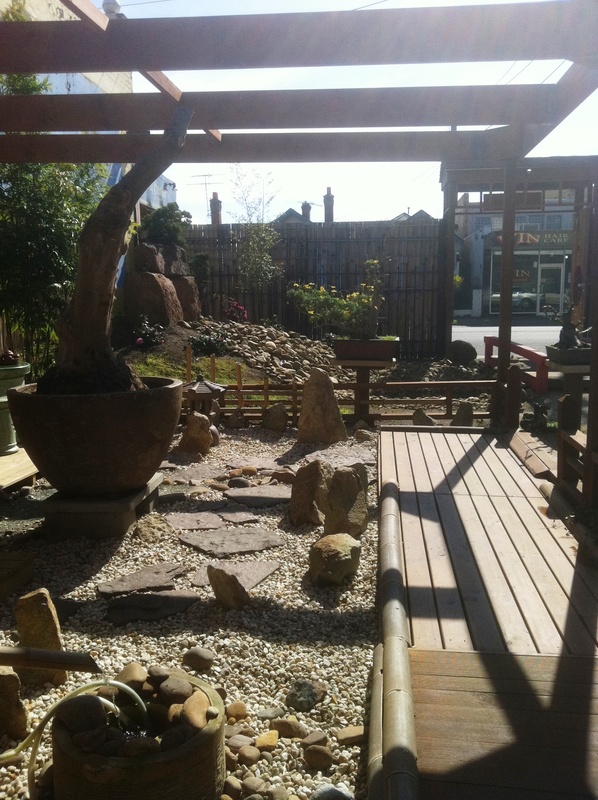 We sat in the sunshine taking in our lovely surroundings and commenting on the workmanship of both the garden and the bonsai themselves. Hau, himself from Vietnam, showed us some photos of the “start to finish” work that transformed the old garden centre. Most of the photos featured Hau himself in pride of place, working hard on the landscaping and the carpentry. Without being asked, he topped our teapot up with fresh water as he described how important the bonsai are to him, pointing out one or two plain-looking branches planted in lacquered pots, and telling us how he would bring them to life over time. Every bonsai in the garden has its own story, Hau said. He showed us one bonsai that has a forked trunk, one part dead, the other part still living and vibrant. He told us a local lady often borrows this bonsai to take to cancer patients in the hospital, to show them that like trees, humans are strong and resilient, and that we will survive even the cruellest injury. 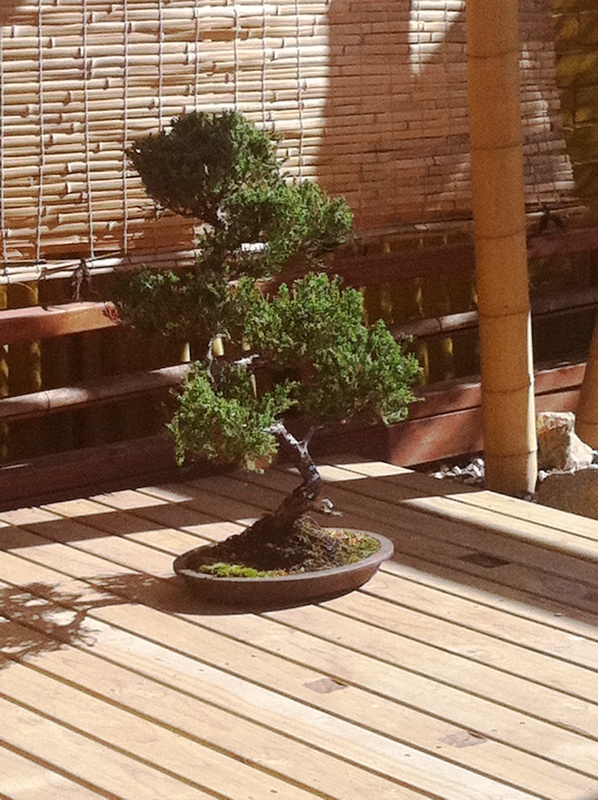 Another bonsai, standing tall on its own podium, is called The Cascade. Bowing gracefully to the earth, the youngest part of the trunk then turns upwards, guided by the wire Hau had twisted around it to bend it to his will. This one, Hau explained, shows us all that even if a big downturn or disappointment happens to us, things will always get better in time. Somebody had suggested to him that he write down the story of each bonsai so that people could read each one in turn, but Hau didn’t think much to that idea. I have to say I agree: no written words could instil the sense of story-telling and passion we got from hearing these stories from Hau himself. We will have to go back many times, drink more tea and learn the stories of all the bonsai living down the street from us. 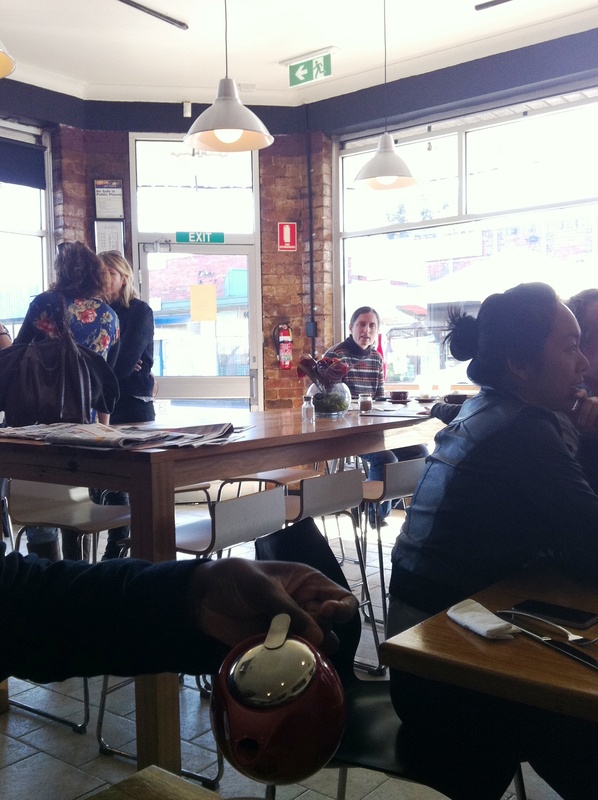 A sunny spring Sunday morning and time to check out the (relatively) new West Footscray place called Gusto @ Barkly. Orlando and I are stalwarts of Cafe le Chien in Seddon, more or less since we moved to Australia in 2005. Although we check out other weekend brunch place regularly, the relaxed atmosphere, familiar greeting as we arrive, perfect weekend music and legendary scrambled eggs keep bringing us back. So we knew Gusto would have a lot to measure up to. Around eleven on a Sunday the place was about half full. We were seated and a drinks order taken quickly and pleasantly. The first impression was one of noise: the decor doesn’t absorb much of the ambient sounds and so we frequently had to lean over the table to hear each other talk. One toddler throwing a tantrum at the door and another who had never been taught about indoor voices didn’t help. There was music playing, I think, but there was no way we could discern the artist. Nonetheless, we ordered our usual breakfasts: chilli scrambled eggs with smoked salmon and bacon for Orlando, poached eggs on toast with mushrooms and tomato for me. Although chilli eggs were not on the menu there was no problem ordering them. I liked that there was a choice of multigrain and sourdough breads (all the bread served is Zeally Bay – nice). A half-strength pot of English breakfast for me and a pot of green tea for Orlando, and we were good to go. Orlando’s order came out a little twisted. 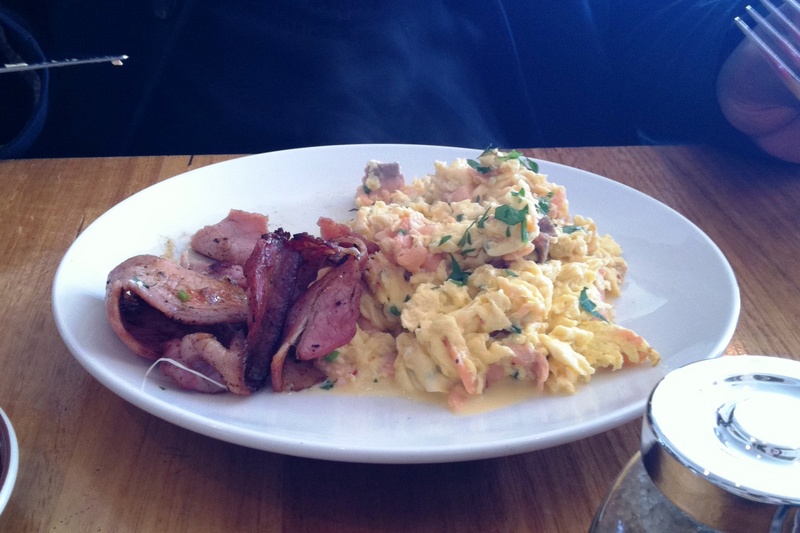 His scrambled eggs did indeed have chillis in them (not a huge amount) but they had also cooked the smoked salmon in there too. Not his favourite way, but not enough of a deal to complain. The bacon was served on my plate rather than his, so we just swapped it over. And, inexplicably, his scrambled eggs were not served on any toast. My poached eggs had come out on multigrain as I had asked: perhaps because Orlando had not specified which bread, they assumed he wanted neither. Again, as he is not a huge carb lover he didn’t bother mentioning it, but if it had been me I would have. The scrambled eggs he declared as tasty enough, but they looked a but milky around the edges to me. On the other hand my breakfast was really good. The multigrain was so much better than the toasted sourdough served at so many breakfast places, which can be hell to slice with a normal knife. 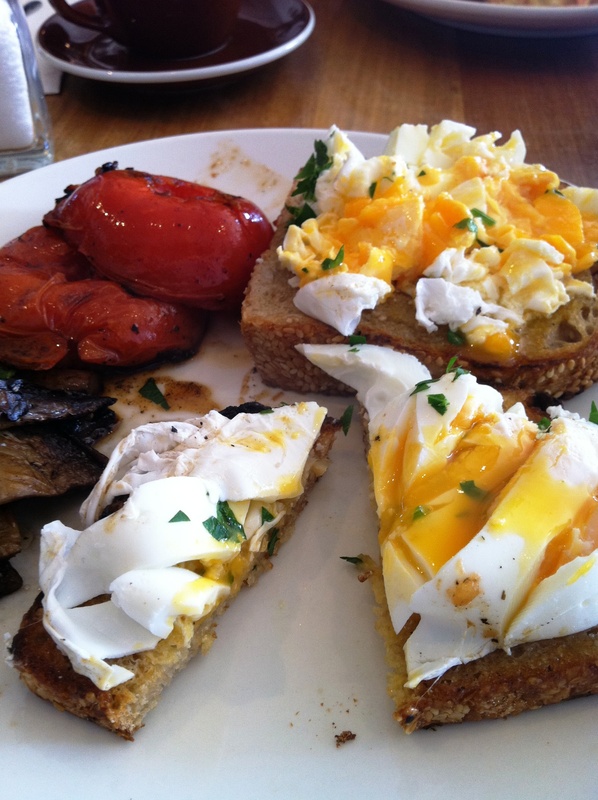 The poached eggs were perfect, and the huge half-tomatoes were slow-cooked just the way I like them. The mushrooms were nicely fried but not in much oil at all, again exactly to my taste. All in all, not a bad breakfast experience, and although the ambient noise would stop this being a permanent weekend fixture, I can see us coming here occasionally for a change. Free wi-fi is also a welcome offer – there’s not many places do this yet. The pizza menu looks good and the short but well-selected wine list looks very like the best of what I’ve been drinking in the past year – at least in the reds section. I will definitely try this place again in the evening and see whether it can fill the gaping pizza-shaped hole in my life: I have to drive for quite a while to get decent pizza in the inner West and I will be quite excited if it is now available on my doorstep.